Oslo is a beautiful city with numerous tourist attractions, museums and picturesque parks for visitors to explore. Located on a picturesque fjord, Oslo is a popular port-of-call for many Scandinavian cruises. 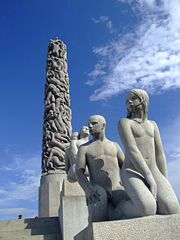 Oslo has a rich history and culture. Visitors can learn about the Vikings, the Kon-Tiki Expedition or about Roald Amundsen's historical sailing adventure through the Northwest Passage. At the Resistance Museum, one can learn about the Nazi occupation of Norway and the Norwegian underground resistance. The city centre of Oslo is situated at the end of the Oslofjord from where the city sprawls out both to the north and to the south on both sides of the fjord giving the city area more or less the shape of a "U". The Aker Brygge district of Oslo is a popular destination for both residents and visitors. Once the location of Norway's largest shipyards, this picturesque setting on the Oslo Fjord has been redeveloped into an exciting shopping and cultural district. From the restaurants that line the waterfront, tourists can enjoy spectacular views of the Oslo harbor. Akershus Slott is Oslo's medieval castle that lies perched on a hilltop overlooking the Oslo Fjord. Built around 1300 AD, the castle is an interesting place for visitors to explore. From the castle grounds, one can enjoy some great views of Norway's capital city, the harbour and the surrounding areas. 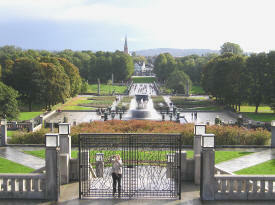 The Oslo Botanical Gardens are located within walking distance of the city centre. Visitors to the gardens can enjoy beautiful shrubs and flowers in a natural area. The Olso Cathedral (Domkirke) is the 17th-century church located on Karl Johans Gate in the heart of Norway's capital city. The Grand Hotel is one of Oslo's premier hotels and architectural landmarks. It is located on Karl Johans Gate, the main street in the city. The Louis XVI revival style building first opened in 1874 and today is the venue for many international conferences and events that take place in Oslo. 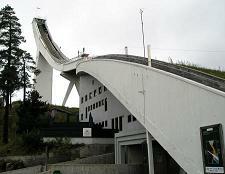 The Holmenkollen Ski Resort is located just north of Oslo Norway and can easily be reached using the T-Bane system. Visitors to Oslo during the winter months can enjoy great alpine skiing, snow boarding and cross-country skiing just minutes away from the city centre. The main street in Oslo is called Karl Johans Gate. It runs from the main railroad station to Norway's Royal Palace (seen below in the far distance). The street was named after after King Karl Johan of Norway. The Nationaltheater is an attractive old building in the heart of Oslo Norway. Most of the theatrical productions are presented in the Norwegian language. The Norwegian Parliament (Stortinget) is home to the 169 representatives that are democratically elected from across the Norway. The Oslo harbor is one of Oslo's great attractions. Situated on the Oslo Fjord, the harbor area is a popular destination for both tourists and residents. The Nobel Peace Center, the Town Hall (Radhus) and the castle are located around the harbor. The Aker Brygge pedestrian walkway is a great place to stroll or enjoy a meal in a picturesque setting. The Radhus is Oslo's Town Hall. The large red brick building, situated near the Oslo harbor, was built in 1950 to celebrate the city's 950th anniversary. The Norwegian Royal Palace (Slottet) is a huge structure located at the end of Oslo's main street, Karl Johans Gate. The palace is the official residence of the Norwegian Monarch and was completed in 1849. Visitors to Oslo Norway can now tour the building. The University of Oslo (Universitetet i Oslo) was founded in 1811 and is Norway's largest and most prestigious university. Some 30,000 students study at the university, which employs nearly 5,000 people. There are daily ferry connections to Kiel (Germany), Copenhagen (Denmark), Frederikshavn (Denmark) and Nesodden. Public ferries run daily to and from the islands scattered in the Oslo harbour basin. Oslo Sentralstasjon is the main railway station in Oslo. From there, there are connections in the directions of: Trondheim, Bergen, Stavanger, Stockholm (Sweden), Gothenburg (Sweden) and Copenhagen (Denmark). In 2004 Norwegian trains were Europe's third most punctual national train company. For the 4 first months in 2005 the punctuality was 92.9%. During winter in particular, weather conditions such as snow and blizzards may cause delays and cancellations on the routes crossing the central mountains. The public transportation system in Oslo is managed by the municipal transport company Oslo Sporveier. This includes metro, tram, bus and ferry, but not the local train lines, which are run by the state railway company NSB. All public transport in Oslo operates on a common ticket system, allowing free transfer within a period of one hour with a regular ticket. Tickets also transfer to the local and inter-city trains, unless you intend to cross the city border. In 2004, 160 million journeys were made using public transport, of which 85% was handled by Oslo Sporveier's own subsidiaries and 15% by private bus and ferry operators under cost-based contracts. The tram system, Oslotrikken, is made up of six lines that criss-cross the inner parts of the city and extend out towards the suburbs. The metro system, known as the T-bane, connects the eastern and western suburbs and comprises six lines which all converge in a tunnel beneath downtown Oslo. The metro lines are identified by numbers from 1 to 6, with two lines running into the municipality of B�rum in the west. The tramway lines are numbered 11 to 13 and 17 to 19. A new, partially underground loop line was opened in August 2006, connecting Ullev�l in the north-west and Carl Berners plass in the east. Two new stations, Nydalen and Storo, have been operational for a couple of years already, the third station, Sinsen, opened August 20, 2006. This completed the loop. In conjunction with the opening of the circle line, there will be a major upgrade of the rolling stock, with delivery taking place between 2007 and 2010. An RFID ticketing system with automatic turnstile barriers has been under introduction for several years, but has been heavily delayed and is not yet in service. Access into the city centre requires the payment of a toll at one of 19 entry points around the ring road. It costs 25 NOK to enter the cordoned zone at all times of day, seven days a week, although a season ticket is available. From Febuary 2nd 2008 coins are no longer accepted at the Toll Station, all cars must pass through the automatic lanes without stopping. If you are fitted with the electronic AutoPASS system then you will be debited as you pass, all other drivers will receive a bill in the post.